3D technology has come into our life, more and more people high on playing 3D movies on 3D TV. When you got a new Panasonic’s Smart Viera TV – which is a perfect example of just how fluid the Smart TV world is. you may want to enjoy 2D Movies on 3DTV with 3D effetcs, But it still can not work. Are you worrying about looking for an easy way to watch 3D movies on Panasonic VIREAR Smart 3D TV? Self-help is better than help from others! How wonderful it will be if we can make 3D Movies from 2D Blu-ray or downloaded Movies by ourselves. So, I have a solution. Here would introduce a professional 2D to 3D Video Converter Ultimate helping you to convert 2D to 3D with ease! 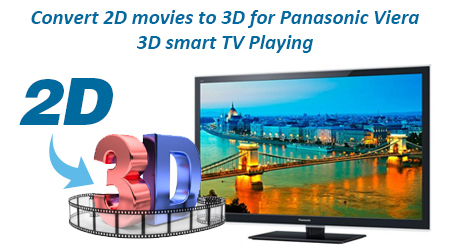 Only 3 steps, then you can get your own amazing 3D movies on Panasonic Viera 3D smart TV! Can’t believe it? Well, you can figure the 2D to 3D conversion out by yourself. Just prepare a set of Blu-ray/DVD discs or other downloaded 2D video files and let’s start! 1. A Blu-ray drive – to make your PC/Mac read this disc. 2.Pavtube Video Converter Ultimate – to roll off your Blu-ray/DVD protection and convert other videos and turn it into 3D. Here is review. 3.A Nice Panasonic Viera 3D smart TV. For those who already have a 3D TV at home but is still struggling to get 3D movies to display correctly on 3D TV, equipping with a professional and powerful video converter is needed. Since no matter you download 3D movies from YIFY, YouTube and other 3D movie download sites or you want to play 3D Blu-ray on 3D TV, all these situations can give you some unexpected issues, such as format incompatibility or region codes, which can make you fail to play 3D movies on 3D TV. Here are some easy-to-use and powerful enough softwares that can be recommended to you. Note: Any video software here has its equivalent Mac version. Here, you can try Pavtube iMedia Converter for Mac which can help you get excellent 3D movies for 3D TV on Mac OS X 10.11 El Capitan, 10.10 Yosemite and older Mac OS X systems. Great News!!! Pavtube Software officially released its 2015 Thanksgiving Deal. UP to 50% off is provided lasting to November 25. Don’t miss it! And find more 2015 Thanksgiving Day, Black Friday Holiday Cyber Monday Crazy Promotion at Pavtube Facebook. Insert your Blu-ray to external Blu-ray drive, then you can load BD/DVD disc or import your videos to this 2D to 3D Converter. Click “Format” and you will find many presets. There are three types of 3D effect: Anaglyph 3D, Side-by-Side 3D and Top-Bottom 3D. Here, you are suggested to choose the presets from “3D Video” option for Panasonic Viera 3D smart TV. a. Adjust target video settings and 3D effect. Click “Settings” which is next to “Format”, free change your target video size, bitrate, frame rate and 3D depth. If you want to get best video quality, pls switch them to “original”. b. 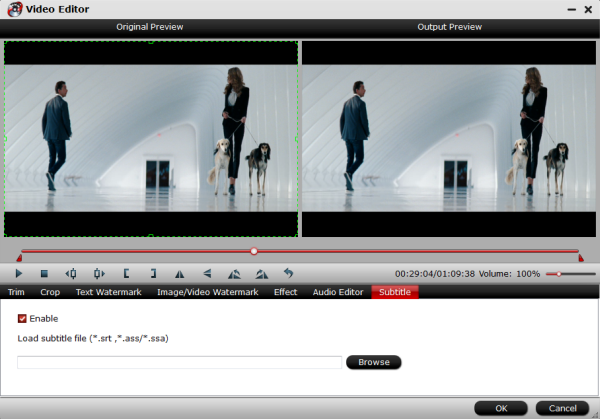 Useful edit functions for enhancing your video files. Clik “Edit” button, you can apply cool effects to your videos. To get more information about this, go to the user guide of Video Converter Ultimate. Now hit the big red “Convert” to start converting videos to start converting 2D to 3D video for Panasonic Viera 3D smart TV. After the conversion, click “open output folder” to quick locate the generated media file and play 3D video files as you wish! Have a nice time! Simulated 3D can bring a stimulating new experience to your favorite blockbusters, home movies and online video. 2D to 3D converter software can help you make the most of your 3D TV or monitor, but you can even use some of the applications to enjoy 3D content without special displays. We’ve looked at a handful of DVD player software with 2D to 3D movie converter technology and liked what we saw. Of course the end result isn’t going to be as impressive as Avatar, but the experience is more than just a gimmick and can be exciting and entertaining. 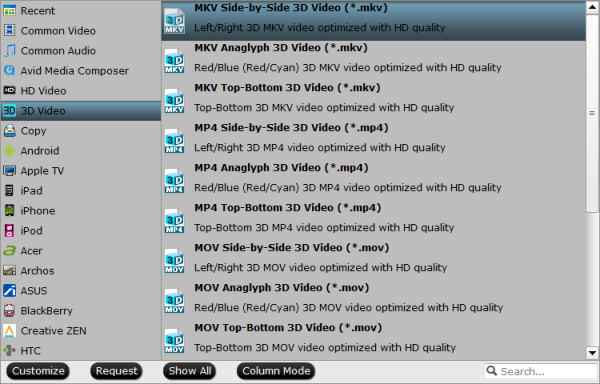 Here is a brief synopsis and review of the best 2D to 3D movie converter software. More than just playing 3D-enabled blu-ray and DVD movies, Roxio’s newest version of CinePlayer can also convert normal 2D movies to 3D. The DVD player software converts movies in real time and works with a number of 3D technologies, including active shutter glasses, line polarized LCD displays, 3DTVs with HDMI 1.4, and a handful of anaglyph methods (red/green, red/blue, green/magenta). The software supports RealD video file formats and is compatible with NVIDIA 3D Vision as well as 3D enabled monitors from Intel and AMD. On a side note, Roxio has been chosen by MSI to provide the 3D technology for their all-in-one touchscreen PCs. TotalMedia Theatre 5 is a great standalone blu-ray player software supporting 3D blu-ray movies, but it also includes their innovative Sim3D technology to transform regular movies to 3D. The software supports NVIDIA 3D Vision, AMD HD3D monitors, Micro-polarized 3D LCD displays and 3D-ready DLP HDTVs. but where this software stands out is the option to use traditional 2D displays and still make it possible to watch movies in 3D, by using anaglyph (red/cyan) 3D glasses. Of course the quality won’t be as good as with specialized hardware, but the adjustable depth perception makes it easy to find a comfortable view. You can switch from 2D to 3D and back again in real time as the movie continues to play. While the other software products listed here are DVD player software suites with 3D conversion added on, TriDef 3D is a product devoted entirely to 3D technology. More than just DVD movies, TriDef 3D also lets you enjoy pictures, Google Earth and video games (over 380 popular games already supported) in 3D. Now you can explore the digital world on Google Earth in full 3D and truly immerse yourself in a 3D video game, from bioShock and Assassin’s Creed to Call of Duty, the Sims, Fallout and Gears of War. TriDef lets you tweak the depth perception and angle with two slider controls. The software supports stereoscopic 3D displays from Samsung, SHARP, 4-D Vision, Dimension Technologies and more. Or you can use your traditional monitor and some old dual-colored lenses (supports red/cyan, amber/blue, green/purple) and see in 3D without the expensive hardware. 3D technology is still very much in the early stages, with active proponents and naysayers commenting on each new 3D method. We’re confident that the technology will continue to improve, but we admit there’s still a long way to go. For now, these 2D to 3D converter software apps are the best way to watch 2D movies in 3D, and they’re an inexpensive way to enjoy your favorite films in 3D. For more 3D viewing options, check out our reviews of the best 3D blu-ray Players. Now, you may have no issues on 2D to 3D Movies via 3DTV playback. Have a nice day! Apple TV 4 vs Roku 4: Which Streaming Solution Is Right For You?